Rega's philosophy is to make high quality products at sensible prices, as a means of reproducing music as faithfully as possible. 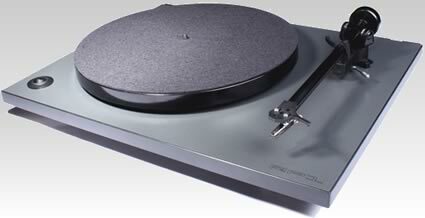 Rega is committed to the design and development of new and existing products, both in turntables and hi-fi. 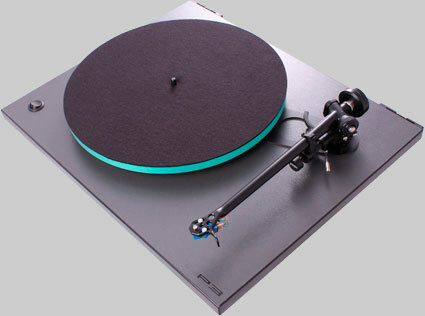 Choose the Rega model that fits your budget. Whatever that price may be, you'll be assured that your purchase will reward you with many, many hours of listening pleasure and faithful service. Phenolic resin flywheel for excellent speed stability. The RP3 has been designed and engineered to achieve outstanding performance way beyond the expectations of a product at this price point. The new Rega RP-3 features several new improvements and enhancements over the P-3 turntable that it replaces. The first change is a newly designed tonearm, the RB-303. 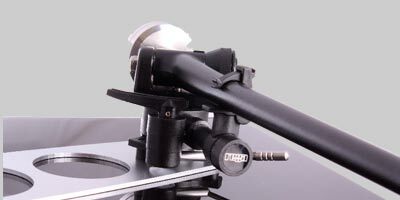 The RB-303 tonearm is drawn upon over Rega’s 30 years experience; it features a brand new arm tube with increased rigidity, and improvements in the bearing gimbals to help reduce friction to a bare minimum. This allows the cartridge to extract all of the information from the grooves of your favorite records much more efficiently and allows you to hear details in your favorite records that you never thought was possible. The Rega RP-3 turntable also includes a new 24 volt motor that has been redesigned to further reduce noise and vibration. In fact, every turntable that features this new motor is fined tuned by hand at Rega's factory to ensure the turntables best possible performance! This new motor and fine tuning process ensures that any vibration or noise is not transferred directly to the platter, so by achieving a lower noise floor, you'll be able to easily hear more low-level details from your records. DB Technology (Double Brace Technology)"Mass absorbs energy - lost energy equals lost music"! Rega has pioneered the use of lightweight rigid plinths. Clever use of lightweight particulate core with a highly rigid phenolic resin skin became the foundations of the high level of performance achieved by the now iconic Planar turntable range. The RP3 takes this design philosophy to the next level. A super lightweight plinth combined with a phenolic resin double brace mounted specifically where the increased rigidity is required (between the tonearm mounting and the main hub bearing) forms a structurally sound "stressed beam" assembly. This rigid plinth design prevents energy absorption and unwanted resonances which will add unnatural distortions to the music. Equally, heavier mass can transfer more unwanted energy such as motor or bearing noise directly into the rotating record. The use of braces instead of the complete skin allows double thickness phenolic resin in these key areas while providing further weight reduction to the plinth which directly addresses the issue of mass absorption and unwanted energy transmission. 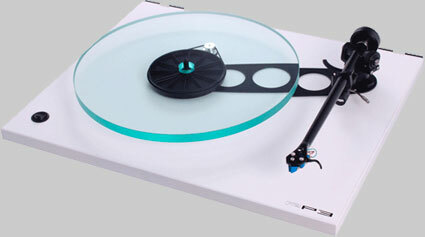 The turntable's platter is manufactured using "floated" plate glass, by utilizing glass; this helps to increase the mass or weight of the platter considerably, improving the platter's speed stability, and accuracy by creating a "flywheel" effect. The Rega RP3 turntable is available in Cool Grey, Titanium & White, as well as, a variety of colored felt mats that will allow you to customize the turntable to your personal taste! $895.00, including installation of the phono cartridge, (purchased separately), hand calibrated by a turntable specialist. Reference level vinyl playback performance at a reasonable price, one of the most anticipated releases from Rega is now here! Presenting the all new Rega RP-6 audiophile turntable! The sleek, streamlined Rega RP6 features no superfluous gimmicks, starting with the Rega RP-6's plinth; Rega has taken their phenolic resin technology, and brought it to a higher level of refinement. Phenolic resin is a very lightweight; but extremely rigid material to create a solid foundation for the turntable without adding a tremendous amount of mass. 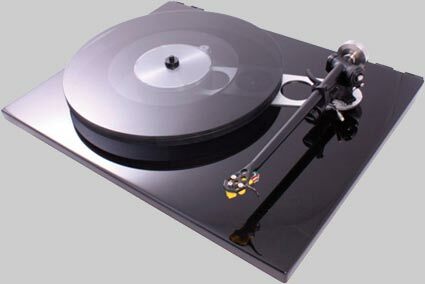 Rega has stated that, "mass absorbs energy, lost energy equals lost music", by using elaborate CNC machining of the phenolic resin plinth, and utilizing an aluminum brace between the base of the tonearm and the tables aluminum sub-platter, creates what Rega calls a "stressed beam assembly. This innovative and clever Plinth design prevents energy absorption and unwanted resonances so that the table's noise floor is greatly reduced and allows you to listen into in your favorite recordings much easier! And to even further enhance this advantage, the Rega RP-6 now features the more sophisticated feet from Rega's premier P9 turntable in order to reduce the amount of vibration from ever reaching the platter. The RP-6 also features the all new Rega RB-303 tonearm,that has been redesigned, culminating from over thirty-years experience, is computer machined from aluminum and then assembled by hand. The new arm is stronger, and features improved gimbals, which gives the phono cartridge the ability to extract even the finest details, Add the innovative 16mm two piece platter design constructed from float glass. This platter is manufactured using a complex and labor intensive invisible UV curing bond technique, the secondary glass ring platter is permanently bonded to the underside of the main platter. The extra ring adds mass to the outer circumference which increases the natural flywheel effect of the platter improving speed stability, accuracy, and consistency. Rega's external power supply/speed control, the Rega TT-PSU, which was optional on their previous models, is now standard on the RP6. The TT-PSU provides better speed stability and the ability to change between 33.3 and 45RPM speeds with the push of a button instead of having to remove the platter and belt. It works in concert with the new 24-volt motor, hand-tuned on each turntable before final assembly. This refinement dramatically lowers the amount of vibration that the motor passes onto the plinth, reducing the noise floor even further while increasing the amount of low-level information you hear on your couch.and will allow you to rediscover your favorite recordings; it's like listening to them for the first time all over again! The all-new Rega P-6 turntable in the gorgeous high-gloss piano black finish is now on display at The Stereo Shop with the Ortofon 2M Bronze phono cartridge installed; bring in a favorite record or two and rediscover how good vinyl can sound! $1,495.00 including installation of a phono cartridge, (purchased separately), hand calibrated by a turntable specialist. TTPSU power supply low distortion sine wave generator. 16MM Glass flywheel platter constructed from float glass.